This guide will show you how to use an Amazon Dash Button to restart or shut down your Raspberry Pi. I had this idea after building my Raspberry Pi magic mirror and failing to install a reset or power button. Whenever I needed to reboot or shut down the mirror, I had to log into it and do it manually. Rebooting your Pi by pulling the plug is a bad idea as it can lead to data corruption. It wasn't worth disassembling the mirror to add a physical switch so I thought, why not hack a Dash Button to do this? This is essentially a wireless Raspberry Pi shutdown/reset switch for $5. Use your Amazon Dash Button to reboot your Pi! Amazon's Dash Button is inexpensive -- and in order to keep costs down, the battery is nothing special. According to Matthew Petroff, it's good for about 1000 presses -- just long enough for the device to become obsolete, in theory. In order to conserve battery life, the Dash Button is normally off. When you press the button, the Dash Button powers on and connects to the network. This is where the magic lies: We can sniff network traffic and detect when your specific Dash Button attempts to connect to the network. Then, rather than ordering an item, we can perform some other command -- anything we want, really. Since we're going to use a Node module to emit events when the Dash Button is pressed, we first need to install Node.js. In order to detect when your Dash Button connects to the network so that we can run a program, we're going to use an awesome module called node-dash-button. You'll need to go through the majority of the normal Dash Button setup. To do this, download the Amazon app for iOS or Android and sign in using your Amazon account information. 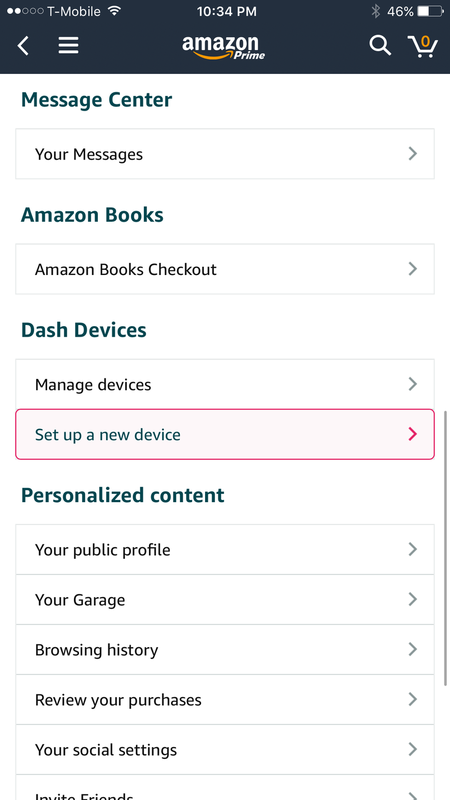 Navigate to Your account > Dash Buttons & Devices > Set up a new device. Follow the on-screen instructions until you get to the "Select a product" step. Then, close out the app without selecting a product. Do not click the X to cancel setup -- just close the app. Your button's hardware address is separated:by:colons and should show up with a message of "Manufacturer: Amazon Technologies Inc." next to it. There may be multiple arp requests coming into your network (made more confusing if you have multiple Amazon devices in your home), so you might need to press the button a few times to identify it correctly. Also, if you have issues detecting arp requests from your Dash Button, try plugging your Ethernet cable directly into your router. I'm going to use this Dash Button specifically for rebooting; however, if you want to use it to shut down your Pi instead, the instructions are the same -- you'll just need to use the appropriate Pi reboot or shutdown command in your reboot/shutdown shell script. I'm going to create a reboot shell script to actually reboot the Pi; then, the node script will execute this shell script. Why not run the reboot command directly instead? I'm using this button to reboot a Pi that performs other commands (like turning off LEDs) prior to shutdown, so I like to contain my reboot commands in their own shell script so that I can execute some commands first. Lastly, we need to run the node script at system start so it will be watching for more reboot commands from your Dash Button after rebooting. Normally, an easy way to start scripts us to use crontab -- however, the node-dash-button script can fail with this method since the network hasn't fully initialized at the part of the boot process when the crontab runs. Therefore, we're going to use a super simple process manager instead called Supervisor -- this manager will also restart the node script if it fails for some reason! Pretty handy. Press your dash button. Your Pi should now reboot! After rebooting, press it one more time to ensure that your node script is now running at system start. The Dash Button has a built-in timeout of about 5 seconds. Make a note of it. Looking for more? The node-dash-button Github repo contains a list of some other great Dash Button projects to keep you busy. Post below or log an issue on my dash-reboot Github repo and I'll do my best to help you out!